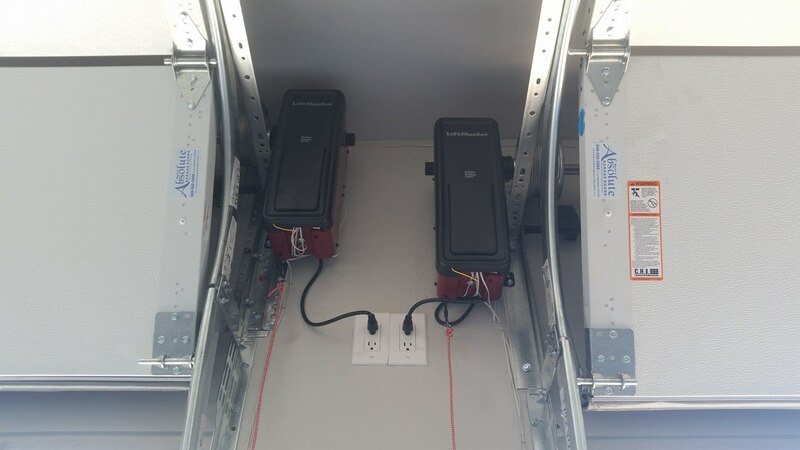 Garage door openers are available in chain, screw, belt, or direct drive and are available from Chamberlain, LiftMaster, Genie, Marantec, and Linear. You can now access your garage with plenty of ease and convenience by installing a garage door opener system. Garage door openers allow you to open and close your garage door without all the hassle and struggle of having to deal with harsh weather. Modern garage door openers come with a wide range of useful features such as automatic and timed close, enhanced energy, efficiency and even back-up power. We currently offer a variety of garage door equipment brands that guarantee a smooth and quiet operation. A perfectly running garage door opener requires that all its component parts be of high quality and in good condition. Everything from the drive chain to the opener tracks and even the garage door remote should work in perfect harmony to allow you to easily and conveniently open and close your garage door. All our garage door openers come with built-in safety sensors that ensure that nothing is blocking the way when closing. This sophisticated safety technology also prompts the opener to automatically reverse operation in case something gets in the way of the door when closing. Indeed, safety must come first when it comes to accessing your garage. Your garage door is no different from your front or back door. Anyone can use it to gain access into your home. Because of this, it is important to ensure that only authorized entry is permitted. Luckily, all our opener products come bundled with garage door security equipment like keypad security systems and remotes. You can gain access into your home by simply inputting a 4-digit pin or by pressing a button on your remote. Our openers come with the latest rolling code technology that ensures that no other garage door remote can open your garage door. Belt Drive Openers – These provide a quiet and smooth-running experience with the option of a power back-up system that comes in handy during power blackouts. Chain Drive Openers – These are very common and provide reliable performance for many years. Screw Drive Openers – These guarantee a smooth-running experience no matter the weather. Residential JackShaft Openers – These can be installed on the sides of the doors if there is not enough space on the ceiling. Any of the above openers can come in handy to make your day-to-day life much easier. Our team of garage door professionals can offer advice on the best opener to suit your specific needs and requirements. Once you have experienced the many benefits of having a garage door opener – you will never do without one. Contact us today to get professional assistance on garage door repair, new garage door installation, and new garage door openers.